Making your clients satisfied is not an easy task at all. You need to know more tactics to handle them properly and following are few tactics that are followed to satisfy your clients. It is very important to treat your customer right in the working environment to make them understand that you give a lot of importance to your customer and give them the priority. When your clients visit your place or you visit your clients place respect them well and thank them for the business opportunities. When there is a meeting between your team and client-side, make sure you attend the meeting with all the requirements that is been needed to answer their questions and fulfill their needs. Most importantly, make a note of things that are required from the client-side and fulfill or modify the project according to their needs. One of the very important things that should be noted if you want to satisfy your client is to be loyal to them. Whatever project or the work you are doing make sure you give your entire effort in it and be loyal in all the works. When you build a trust with your clients, it will automatically create a good relationship which will make your clients get satisfied with your works. Something which should be avoided in the business environment is that you should never ever ignore the complaints of your clients. Make them feel comfortable and have a pleasing environment when they come for making a complaint. When you do these things right, they will change the mind even if they are in a complete tension. This is one of the psychological ways of handling your clients if they are coming for making complaints. It is always good to listen to your clients if they are coming to your workplace. That is the best way to let them know that you are giving them priority and they matter to you and your businesses. When you let them realize their importance, they will have a good impact on your side and have a satisfaction at your work. 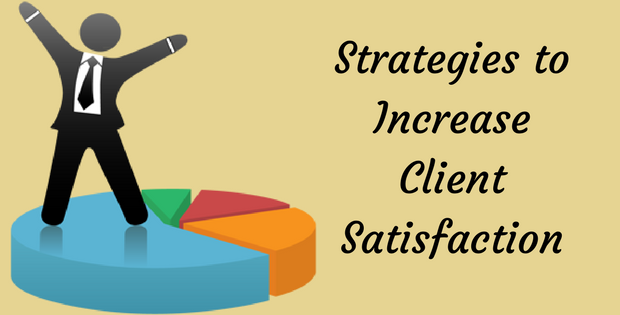 Hope this article on Strategies to Increase Client Satisfaction is useful to you. For more articles on different technologies, keep following Bizzway.